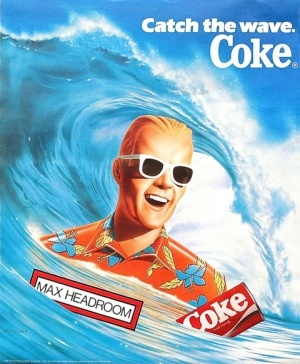 If someone knows Max Headroom from just one thing, it's probably not the talk shows or the ABC series... it's the doomed campaign to sell "New Coke" to a market that had already rejected it once. I have decided not to try and fold the Coke material into the rest of the site. There's just too much of it and it's almost worth a site of its own. Keep an aye-eye on this space, though: I intend to assemble a definitive look at the New Coke campaign in general and Max's heroic efforts on its behalf. This page was last modified on 8 January 2016, at 09:28.